What is 'Above The Fold' Content on a Website? What is ‘Above The Fold’ Content on a Website? What is ‘Above The Fold’ Content? At the most basic level, ‘Above the fold’ content is that which first appears on a website without a user having to scroll. On a more detailed level, the specific size of the above the fold area isn’t a strictly defined size, because of the ever increasing array of different screen sizes, resolutions and devices that are used. Looking at what content is displayed ‘above the fold’ is still very important for both SEO and conversion rate optimisation. How many users scroll below the fold? One of the most frequently quoted studied from 2006 by web usability consultant Jakob Nielsen found that as many as 77% of users did not scroll downwards when using a website. 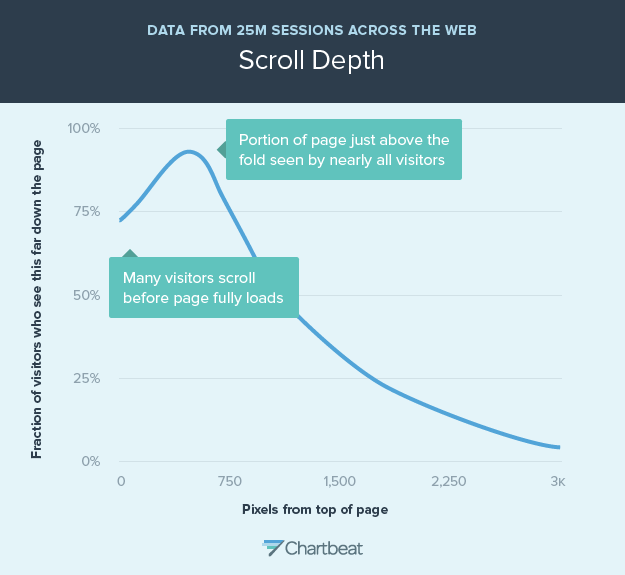 This high finding, and indeed the notion that a high percentage of users do not scroll, has been challenged, and even described as a myth by other experts. A study from Chartbeat in 2013 showed that the most popular area on the page was just above the fold @ 550px with 80% viewership, with 50% of users viewing as far as 1500px down the page on content pages, falling to 50% viewing 1000px down on homepages and storefronts. Regardless of the specific depth that users scroll to, studies seem to universally indicate a drop off in attention in lower regions of pages below a certain level. In conjunction with page speed, ensuring that their is sufficient and engaging content above the fold can be an important factor. How many pixels is the ‘above the fold’ area? As mentioned above this varies by screen size, resolution and device used, and also there are other factors such as the browser used and the various browser configurations. 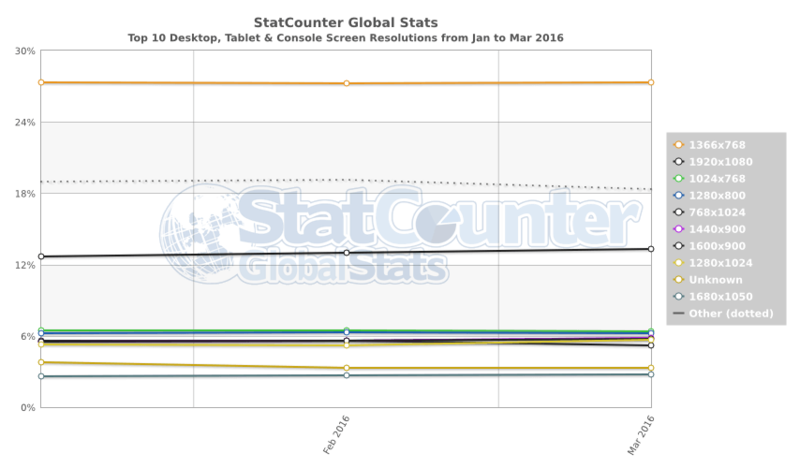 Statistics from Statcounter show that this year the most common desktop/laptop/tablet screen size was 1366×768, followed by 1920×1080.